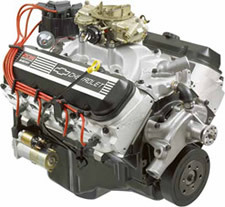 ZZ502/502 Deluxe - The ultimate crate engine kit for a 502" big-block. For those of you who want your ZZ502/502 already assembled, GM Performance Parts has just what you need. The ZZ502/502 Deluxe crate engine includes the entire engine, from carb to oil pan, and comes completely assembled from the factory. 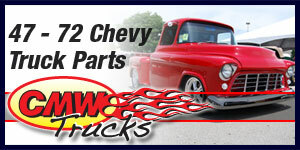 It includes a Holley 850-cfm four-barrel carburetor, dual-plane water intake manifold CNC-port matched to the oval-port heads, starter, distributor, plug wires, and water pump. The ZZ502/502 Deluxe big block Chevy crate engine offers you a GM Performance Parts-tested and validated 502 horsepower/567 lb.-ft. of torque combination with a 12-month warranty. The ZZ502/502 comes with our aluminum oval-port, big-valve street heads that flow enough air to satisfy the demands of the hungry 4.47" bores and 4.00" stroke crankshaft. To ensure a long and productive life, this performance big-block is based on a Gen VI block with four-bolt mains, a forged steel crank, forged steel rods, and forged aluminum 9.6:1 pistons. Carburetor and starter not installed because of crate fitment.